Discover America's best values direct to you from the Heartland. 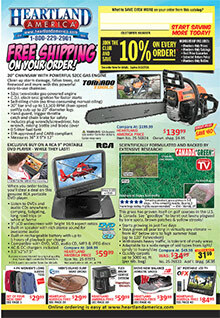 Check out the latest in electronics, housewares, jewelry, tools, automotive, computers, sporting goods and hundreds of other clearance products at great prices 50-70% below retail. Your savings will be automatically applied at checkout on the Heartland America website. Some items may have additional shipping charges because they are heavy or oversized. Some products may also incur additional fees such as adult signature required upon delivery.